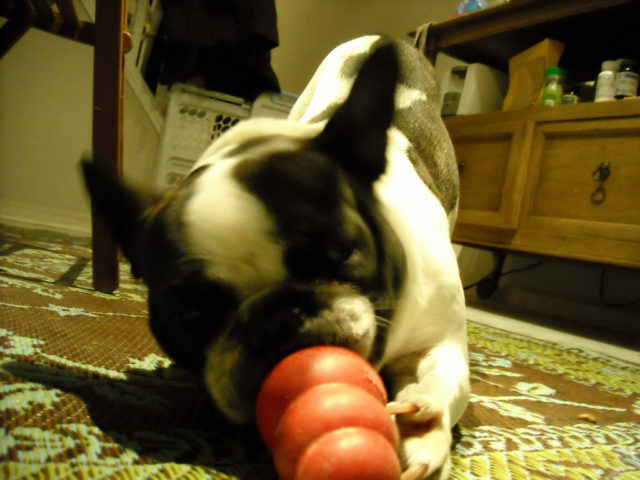 Did you know there are several different types of dog Kong treats that you can put inside your dog’s Kong toy? That’s a good thing because variety is the spice of life — especially in your dog’s world. When filling your dog’s Kong with treats, you want to use extra special items that your dog really likes; ones that he doesn’t normally get every day. The reason? Because usually the goal is to keep your dog focused on his Kong toy — like to alleviate boredom when you’re gone or to prevent chewing on other things inside the house. But if there’s nothing “special” inside his Kong toy, then your dog is likely to get bored with it rather quickly and move on to other (possibly more destructive) things. To keep your dog’s attention on his Kong toy for a longer period of time, fill the Kong with hard treats — which will challenge your dog more by making it more difficult to get the treats out of the Kong. If you just want to give your dog a quick treat in his Kong toy, then put soft treats inside — which give your dog an almost instant reward. For the best of both worlds, include both hard and soft treats inside your dog’s Kong toy. And if you want to increase the challenge for your dog, then toss in a sticky substance like peanut butter or Kong peanut butter paste! See how to stuff a Kong toy. For the longest time, I’ve used the Kong peanut butter paste — which comes in a can very much like Cheese Wiz. Both of my min pins love it when I fill up the Kongs with the peanut butter paste. They will not give up the Kong until they know every last drop is gone out of the Kong. I had to stop giving them the peanut butter paste after one of my dogs had to be put on a diet. Now I just fill their Kongs with carrots instead. I peel them and cut them in all different sizes ahead of time. Then I use them as a treat whenever they are good. And I use them as dog Kong treats as well. Here are some DIY dog Kong treats & healthy recipes to stuff inside your dog’s Kong toy.